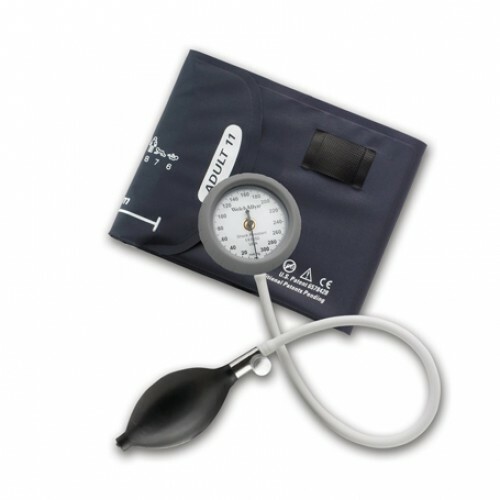 DuraShock Bronze DS44 Integrated Aneroid Sphygmomanometer by Welch Allyn is part of the DS44 Series that's compact, lightweight and most of all will stay calibrated longer than traditional blood pressure gauges. In fact, the DuraShock line passes the Association for the Advancement of Medical Instrumentation shock resistant testing. This means it wills stay in calibration after being dropped 30 inches onto a hard surface due to its protective bumper around the dial. This means lower replacement costs overtime. The Bronze Series also offers a 5-year calibration warranty. Additional features include an integrated-style gauge that snaps into the cuff with a FlexiPort cuff-mounted design. The gauge can rotate 360 degrees to be viewed from all directions. You may be interested in Welch Allyn's premium model DS58 Platinum Series that comes with a lifetime calibration warranty.